Four recipients of the Distinguished Service Cross, America's second-highest medal for valor, were inducted yesterday into Fort DeRussy's Gallery of Heroes in a ceremony at the Waikiki U.S. Army Museum. Ian Matsuichi Yogi, held by his grandfather Larry, posed with a portrait of his great-uncle Matsuichi. 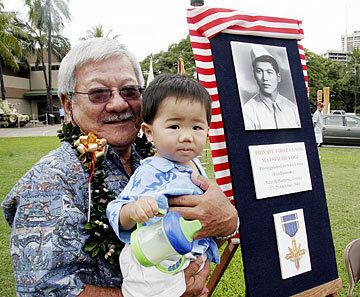 Other veterans honored were Irving Akahoshi, Bob "Hoichi" Kubo and Larry Tanimoto. 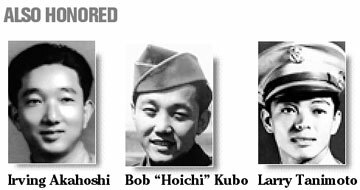 All were members of the 442nd Regimental Combat Team who served in World War II.